If you own Gionee F103 2GB RAM, please do leave your feedback too. Lowest price of Gionee F103 2GB RAM price in India starts at Rs. 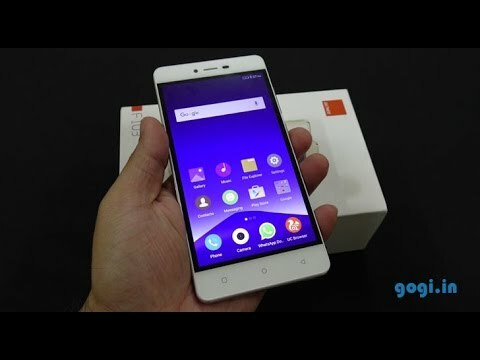 5,299 Gionee F103 2GB RAM is available on Flipkart at Rs. 5,299 and on Amazon at Rs. 5,390. Prices updated on 21st April 2019. The Chinese manufacturer Gionee has recently come up with it’s new series of smartphones. The main target audience for the company would be the Fashion conscious people. The F in the model name stands for the same and hence the name Gionee F103. You can also check for the other 1GB (Gionee F103 1GB) & 3GB (Gionee F103 3GB) variants. The phone has a 5 inch display which is handy and should be easy for one hand operations. The display has a resolution of 1280x720 pixels making 294PPI which is good but indeed not the best. It sports a Quad Core Processor clocked at 1.3GHz along with 2GB RAM. The more RAM makes it a huge plus for multi-tasking. However more specific details about the processor has not been disclosed by Gionee. The phone sports an 8MP rear camera with a single LED flash and is capable of HD video recording. At the front sits a 5MP camera. The phone is powered by a 2400mAh battery. It is a Dual SIM 4G capable device. It has an internal storage of 16GB out of which 9.5GB is available to the user and is expandable up to 32GB via a MicroSD card slot. The phone runs on Android 5.0 Lollipop out of the box & running on top is the Gionee’s Amigo UI 3.0. 1. Does this support Reliance Jio SIM cards? Ans: It would support a Reliance Jio SIM and 4G network but since it doesn't support VoLTE, you will have to use the app provided by Reliance for making and receiving calls. We would recommend going for a phone that supports VoLTE & supports Jio natively. 2. How is the gaming performance on this phone? Ans: While you can find better phones in this price range for gaming, the F103 won't be bad for moderate gaming. Don't expect great performance for graphics heavy gaming. 3. What is the maximum memory expansion available on the F103? Ans: While the device has 16GB of onboard storage and can be expanded by an additional 32GB by using a mcro-SD card. 4. Does this device support USB OTG attachment? Ans: Yes, USB OTG is supported. Though you need to arrange the cable for the same. 5. Can this phone record slow motion videos? Ans: The Gionee F103 doesn't support recording of slow motion videos out of the box. 6. What accessories are bundled in the box? Ans: Apart from the handset you have Charging Adapter, microUSB Cable 2.0, earphone with mic, user guide etc, scratch guard & a back case. 7. Will both SIM cards support 4G Internet? Ans: While both SIM cards on the F103 support 3G connectivity, only one of them will support 4G connection.